On the afternoon of January 29, 2018, Eric, a 15-year veteran, was running some errands while off-duty. After turning off a local Interstate, Eric noticed a teenage boy on the overpass standing on top of the Jersey barrier staring at the freeway below. That’s when Eric’s instincts kicked in. Eric pulled his car over and cautiously approached the young man. Eric used all his training and experience to persuade the young boy not to jump. After some careful negotiation, Eric was able to gain the boy’s trust and convinced the boy to step away from the edge. When the police arrived, Eric learned the boy had been reported missing for the last 24-36 hours. The Chief of the Lakewood Police Department presented Eric with their Life Saving Award for his heroic actions on this day. 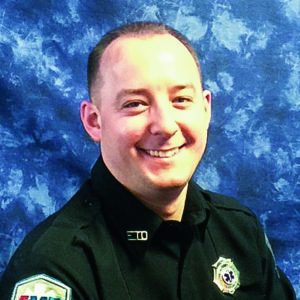 Eric is truly a caregiver willing to go above and beyond for the community he serves, and is a perfect example of what it means to be a Star of Life.